American YouTubers looking to go “virtual” can now turn to a live animation specialist for custom 3D character creation and software to bring their own characters to life. Professional performance animator Gary Jesch of CHOPS Live Animation is willing to lend his expertise and production studio capabilities, to supply everything needed to do live streaming of “vtuber” shows, including the character design and production, the computer system and the software license to his 3D Digital Puppeteer™ software. He’ll personally train a “vtuber” artist to control the avatar via a digital pen/tablet and game controller, so that no motion capture equipment is needed. Jesch’s system analyzes the sound of the actor’s voice to drive the movement of the lips. The facial expressions are controlled in real time via “virtual sliders” on a digital tablet drawing surface. His software runs in Windows 10 and is known for its reliability and performance-friendly operation. He estimates the entire package could be done for under $20,000 depending on the animation requirements. Customers who pay for their own exclusive characters will own them completely, including copyrights, and sometimes they can recover their investment by selling character-related merchandise. They might also be able to find sponsors for their shows, or incorporate sponsors’ videos and product exposures, integrating them into their live performances. 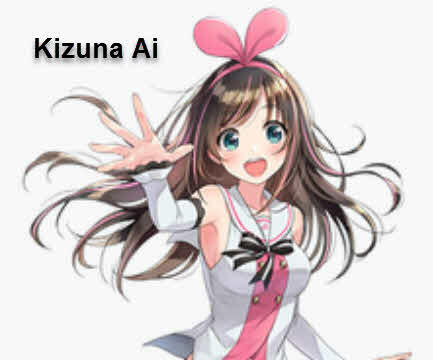 The “vtuber” culture started in Japan, where one of the most famous of the anime-style virtual characters, Kizuna Ai, attracted hundreds of thousands of followers. Often the avatars of Japan appear on screens with video games or sing popular pop songs. The Digital Puppeteer ™ offered by CHOPS is designed to use 3D characters created in Autodesk 3D Max, and rendered in real time at high frame rates at a variety of resolutions. The system allows a user to overlay the avatar on top of graphics produced on a second computer (such as game play) by connecting it via a local area network (LAN). The software itself acts as a media controller for video and still backgrounds and overlays. It also has a built-in audio mixer and webcam controls. By using two Digital Puppeteer™ systems together, a user can get two characters on a single-screen at once, with two people interacting with each other in real time. The output can be streamed live via Mixer, Twitch, Facebook or YouTube, using OBS or Xsplit. In fact, with Xsplit, the same stream can be sent to Facebook and YouTube simultaneously while recording it locally. The team of artists at CHOPS uses the customer’s reference art to build the 3D model and animate it with movements and facial expressions. They’ve done characters like talking fish, floating 3D heads and caricatures of famous celebrities, including their most recent work – “Virtual Yogi Berra.” “Virtual Yogi” was introduced in December 2018 at the Baseball Winter Meeting in Las Vegas and appears on stage for corporate meetings and sports special events. Jesch learned that there’s a demand for photo-realistic interactive avatars like “Digital Doubles” of human beings, as well as characters who look like they stepped out of a video game. To fill that demand, he’s partnered with a new 3D character animation studio called Mimic Productions from Berlin, Germany, headed by facial animation specialist David Bennett and fashion artist Hermione Mitford. Mimic Productions and CHOPS Live Animation are combining resources in the US to deliver some of the most amazing 3D character work now available. CHOPS’ success with live performances and Mimic’s technical and artist talent with facial mocap and 3D character creation are leading to breakthroughs of realism never seen before in live animation. If a “vtuber” with deep pockets wants a realistic virtual character, Jesch says he will be happy to take their project to Mimic for production. Such live, animated, photo-realistic “Digital Doubles” on YouTube would be a first.